To me, a master clock is a device employed to synchronise the sample rates of multiple digital devices; it’s the conductor of the orchestra and nothing more. So if you don’t have multiple devices that need to be sync’ed, you don’t need an external clock! Many others, though (including many clock manufacturers and their marketing staff! ), seem to view it as a magical tool, with mystical abilities to ‘improve’ the sound of the entire orchestra, and I have trouble with such assertions. I don’t doubt that externally clocking some converters, consoles, and interfaces can influence the sound character — I know from first-hand experience that it can! But I also know that: firstly, if it does influence the sound in any way at all, that’s not a positive attribute of the master clock but a negative concerning the design of the converter, console, or interface; and, secondly, any ‘change’ in the equipment’s performance rarely measures as a technical improvement — indeed, there’s normally a measurable degradation. Like its predecessor, the Micro Clock MkIII is a compact 1U half-rack unit, but this latest incarnation benefits from a major redesign. It measures 152 x 44.5 x 165mm (6 x 1.75 x 6.5 inches), weighs a hefty 1kg, and it’s supplied with removable rack ears, although given the compact form of this unit, they’re more like rack wings! Power is provided by an external moulded wall-wart which provides 9V DC via a coaxial plug. Strangely, the Micro Clock’s rear panel doesn’t state the expected voltage, which could lead to an unfortunate accident, and the review model’s wall-wart had the US-style mains plug. Power consumption is about 6W, and the unit runs slightly warm to the touch. The front panel is very straightforward, with buttons to power the unit and dim the sample rate display, a rotary encoder to change the sample rate, and a large LED numerical display. The only non-intuitive aspect of operation is that the rotary encoder has to be moved slowly, and over three-clicks, before the sample rate changes. By design, quick turns of the knob, and single clicks, do nothing: this operating paradigm is intended to prevent inadvertent sample-rate changes. A note printed in large text is included in the box to inform users or this approach, and it’s also mentioned in the manual, though I feel that the addition of some kind of marking on the front panel to remind occasional users would be useful. The rear panel features six clock outputs on BNC sockets, all of which can carry the unit’s full sample-rate range of 44.1 to 384 kHz. 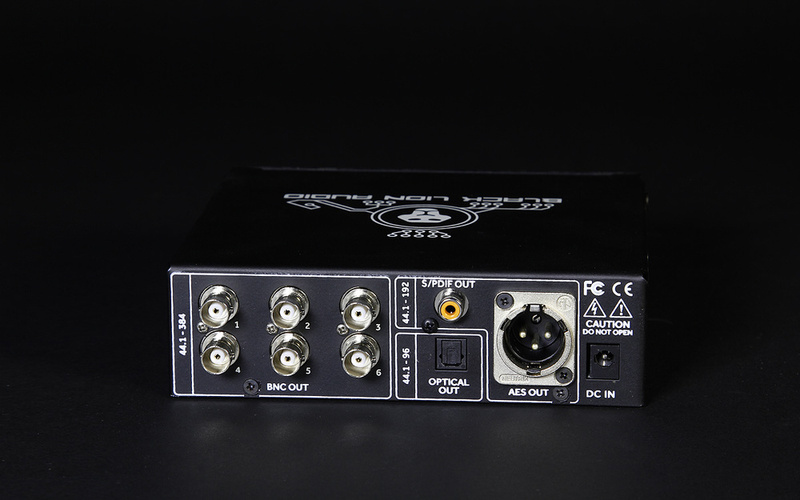 S/PDIF clocking outputs are also provided, with both coaxial (RCA/phono) and optical (JIS F05) sockets, and an AES11 output on an XLR completes the connectivity. The coaxial S/PDIF and AES outputs can both carry sample rates up to 192kHz, while the optical F05 socket only works for base and double sample rates up to 96kHz (and there is no ADAT compatibility). The Micro Clock MkIII sports six BNC outputs, as well as optical and coaxial S/PDIF and AES sockets. More tangibly, the additions of the LED frequency display, the S/PDIF and AES outputs, and a doubling of BNC outputs, all make the Micro Clock MkIII much more versatile than its predecessor. And, should anyone have need of them, this new product also offers sample rates of 352.8 and 384 kHz (the MkII stopped at 192kHz). In terms of specifications, the jitter performance is stated as 1.92ps (RMS) which is around five times lower than the specification for the MkII design. Looking at the output signals on a digital oscilloscope, the square-wave BNC outputs are beautifully square and clean, and so too are the encoded S/PDIF and AES outputs, at all available sample rates. I didn’t perceive any changes to the musical quality of clocked devices, but then I didn’t expect to — the converters I use in my mastering console and outboard were selected specifically because they use internal sample-rate conversion technologies to completely isolate external reference clocks from the internal converter clock. What I can say is that all the converters and equipment I slaved to the Micro Clock had no difficulty at all in locking to its clock signals, and the variety of output formats made it relatively straightforward to find suitable configurations. 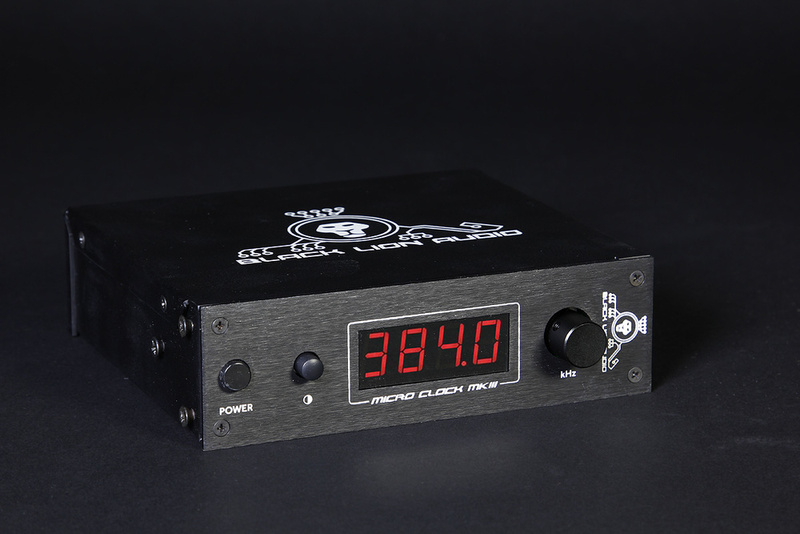 Black Lion products always seem to be well-designed and well-built, and the Micro Clock MkIII is no exception. If your digital studio equipment would benefit from a central master clock, the Micro Clock MkIII offers an attractive solution with a good range of well-engineered facilities and no unnecessary frills. Alternatives at a similar price point include the Antelope Audio LiveCLock, Drawmer’s M-Clock Lite, Mytek’s Studioclock192 CX, and the Rosendahl Nanoclocks. Wide range of sample rates. Non-obvious operation to change sample rate. The latest evolution of Black Lion’s master clock design has more outputs, a sample rate display, and usefully improved technical performance throughout.